South Korea and Britain had a ministerial meeting in London this week on improving strategic partnerships between the two sides on a broad range of diplomatic and economic issues, Seoul's foreign ministry said Thursday. 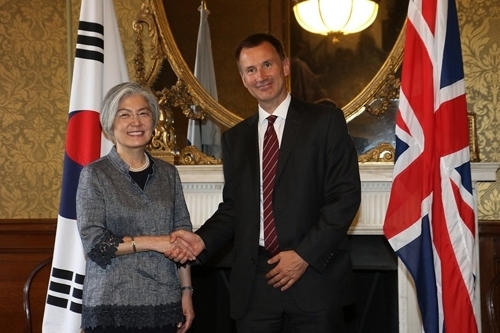 On her first trip there as South Korea's top diplomat, Kang Kyung-wha met with her new British counterpart Jeremy Hunt. It marked the fourth "strategic dialogue" between the two countries. Kang briefed him on her government's efforts for the complete denuclearization and a peace regime on the Korean Peninsula, and requested Britain's continued support for the initiative, the ministry said. In response, the secretary was quoted as stressing the need to maintain international sanctions on North Korea until it takes concrete steps toward denuclearization. On Brexit, Kang and Hunt also pointed out that the transitional period, agreed to in the EU summit in March, will be conducive to smooth shifts in related treaties. The formal transition time is due to last from the official Brexit day on March 29, 2019, to Dec. 31, 2020. They agreed to continue close cooperation for the sustainable development of Seoul-London ties even after Brexit. Britain is South Korea's second-largest trade and investment partner in Europe. Kang expressed concern about a cross-continent trade war. The EU announced provisional safeguard measures Wednesday against imports of a number of steel products, saying it's meant to protect the local industry amid the Donald Trump administration's aggressive trade policy. Also discussed were ways to strengthen cooperation on global affairs, including a campaign to prevent sexual violence in conflict-hit regions. Meanwhile, Kang had a luncheon meeting with British lawmakers and visited a memorial to Britain's participation in the 1950-53 Korean War. It dispatched 81,084 troops to help the South fight against the invading North, and 1,106 of them were killed, with 2,674 others wounded, according to official data. She then presided over an annual meeting of the heads of South Korean diplomatic missions in Europe, Russia and Central Asia.